As a business owner, you want a fence that not only adds curb appeal to your commercial building, but also improves security. So what type of fence do you choose? There are more than a few viable options, including Vinyl Fences, Wood Fences, and Chain Link Fences. However, there is one type of commercial fence that stands out amongst the rest: Aluminum Fences. Aesthetics: Aluminum fences provide a curb appeal unmatched by other types of fencing. Cost: Believe it or not, these aesthetically pleasing are much more affordable than you would think. In fact, aluminum fences are much less than traditional wrought iron fences. Durability: Unlike iron, a ferric metal, aluminum will not rust. It is estimated that aluminum will take more than 10,000 years to disintegrate. Low Maintenance: Unlike wrought iron or wood fences, aluminum fences do not need to be painted annually. Security: If you want to improve the security of your property, you want an aluminum fence. Aluminum fencing with spear-topped pickets are incredibly difficult to breach. If you are looking for aluminum fences in Northern Virginia, you have come to the right place. Hercules Fence offers the buying power of the largest fence company based in Virginia, meaning we can buy the fence you want at a price you will love. We pride ourselves in installing high quality fences at affordable prices. 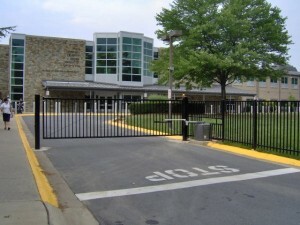 Hercules Fence is also the largest fence company based in Virginia. We pride ourselves in installing high quality fences at affordable prices! This entry was posted on Friday, September 27th, 2013 at 1:47 pm. Both comments and pings are currently closed.